Blunda och känn den svarta sammeten smeka. De mörka maltsorterna har rundats av med några nävar havre. Galena, Hallertau Brewers Gold och Centennialhumle friskar upp och överraskar. 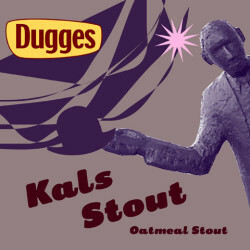 En ”Stout” är ju ”aldrig fel”, men Kal dricker den gärna till sina skaldjur. 500ml bottle at home. Dark brown color with off white head. Light roasted malty aroma, milk chocolate, ice instant coffee, light hoppy. Sweet and bitter taste. Medium oily body with soft carbonation. Kolmörk med hygglig krona, ganska stora bubblor! Doftar svagt av malt. Smaken ganska tunn, havremalten märks. Eftersmaken tämligen kort, upplevs lite blaskig efter att inmundigat vissa mer smakrika porter & stouts de senaste veckorna. Dark amber body with a big beige head. Aroma is mild roasted malt, chocolate, and fruity hops. Flavor is sweet, roasted malt, coffee, chocolate, dry fruit and balanced bitter. Fine body and aftertaste. A very pleasant traditional stout that’s really easy to drink a lot of. Craft Holborn. Keg. Opaque dark brown beer, small pale tan head. Palate is smooth and airy and semi dry. Mild fine carbonation. Smooth dark malts, dry and carrying mild lacto cream. Light dry finish, little minerals. Pretty simple stuff but drinkable. Keg at the Cask, Pimlico, 11/06/14. Dark chestnut brown with a moderate light tan swirl. Nose is earthy cocoa, light roast, toffee, nutty pangs, fruit cake mix. Taste comprises mellow dark fruits, toffee fudge, cocoa dusting, sprinkle of brown sugar. Medium bodied, fine carbonation, semi drying close with sweet pangs. Pours black with a finger of head. Nice roasted aromas, both fresh and murky at the same time. Dark roasted malt, coffee and cocoa. Medium bodied palate which feels slightly watery on and off throughout the taste, but with nice roasted elements to the flavour. Malt-driven. Medium finish and low bitterness. Backlog. Tried a number of times. One of the best from Dugges. Dominated by chocolate, oatmeal, coffee, orange zest and dried fruits. (backlog) Botte. Black pour with beige head. Sweet malt, chocolate, oatmeal and a light mineral aroma. Not so intense oatmeal, chocolate and roasted flavors.